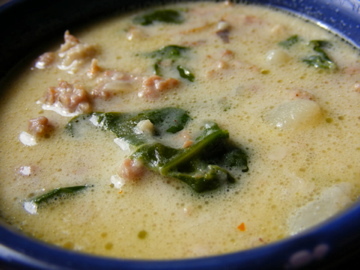 This a variation of a well known Italian restaurant’s Toscana Rustica soup. When I taught a cooking class at our homeschool co-op, a lovely pair of twins brought this soup to class. Their grandmother had worked tirelessly until she mastered the re-invention of their favorite restaurant soup. So, if you're longing for a cozy night in with a your favorite Italian soup, forget about take-out...try this! Squeeze sausage out of casings, break up and brown in large soup pot. Add onion, garlic, bacon, red pepper flakes. Cook until onion is translucent and bacon is cooked through. Add broth and potatoes. Cook on medium low for about 20 minutes until potatoes are tender. Add evaporated milk, kale. Taste before adding salt and pepper. Let cook another 10 minutes on low. Serve with some crusty bread and a salad made of sliced tomatoes, basil leaves and fresh mozzarella drizzled with a balsamic vinaigrette. Mmmmm! dont you use any water?